Forum Index > Historical Arms Talk > Forest Bill / Welsh Hook? Posted: Wed 01 Feb, 2017 5:20 am Post subject: Forest Bill / Welsh Hook? Are there any sources that mention this weapon other than George Silver? And do we know what this weapon looked like aside from the fact that it had a hook and an edge? Also, According to George Silver the Black Bill and Halberd were "weapons of weight" 5-6 feet long, although from what I understand halberds could often get quite a bit longer than that. Would an 8-9 foot halberd with a relatively lightweight head be used in the same way as Silver's Forest Bill? Posted: Wed 01 Feb, 2017 4:52 pm Post subject: Re: Forest Bill / Welsh Hook? Are there any sources that mention this weapon other than George Silver? If you mean other combat treatises, I'm not aware of any. It may be mentioned in military texts or histories. And do we know what this weapon looked like aside from the fact that it had a hook and an edge? Yes, we do, as several survive. There are two examples in the Higgins Collection: accession number 2660, which appears to be a reproduction from 1910; and accession number 2689, which is probably an original. There's a pair (but only one object number: VII.822) in the Royal Armouries. And there are two more in the Metropolitan Museum of Art's collection: accession number 14.25.140 and accession number 14.25.155. If it's light enough, I'd imagine so. But note that the great majority of treatises that discuss staff weapons say that they're all used in basically the same way, allowing for minor differences in the heads--primarily that some can and some can't hook. Silver's comparisons concern weapons' relative mobilities and lengths, so the head on that halberd would have to be pretty light. Thanks for posting those links, Mark. Quite interesting. I think that there is a lot of confusion over the nomenclature for polearms. Many of the words used to seemingly describe a pole weapon with certain attributes almost invariably becomes prescribed or adopted by another weapon with completely dissimilar configurations. For example, Ewart Oakeshott described a guisarme/giserne as a crescent shaped axe with double sockets, based on the fact that the terms giserne and axe are used interchangeably in the poem "Sir Gawain and the Green Knight" and a contemporary illustration from the 14th century shows Gawain holding the weapon with double sockets and crescent axe shape. (We could have a long debate about this). Similar weapons to Oakeshott's guisarme became an iconic accessory for the Russian Streltsy in the 16th or 17th century and was called a bardiche. But the term bardiche may date back to the 15th or 14th century, and obviously items bearing that appearance date back even much further (see sparth axe). But stating this, I should point out that the term guisarme had been associated with a large family of polearms with prominent hooks dating back multiple centuries in France. So terminology for the same item changes by nationality as well as time period. I've always assumed that the "Bill" or "brown bill" was something that would look like what we, in the U.S.A., often refer to today as a "brush-axe". A short stout hafted pole with a broad curved blade on the end. The sharpened edges relegated to the concave side of the hook and body the blade. It's a quintessential tool for clearing narrow limbs, saplings and moderately sized shrubbery. In a forestry sense, it's ideal for growths that are not quite large enough to necessitate a pole-saw, but require more reach or leverage chopping than most axes or machetes can accomplish. And by extension, that a "black-bill" (or what the French referred to sometimes as a guisarme) would have been pretty much the same thing but on a longer pole, perhaps with langets (to protect the haft) and perhaps auxiliary spikes or hooks for thrusting and grabbing. 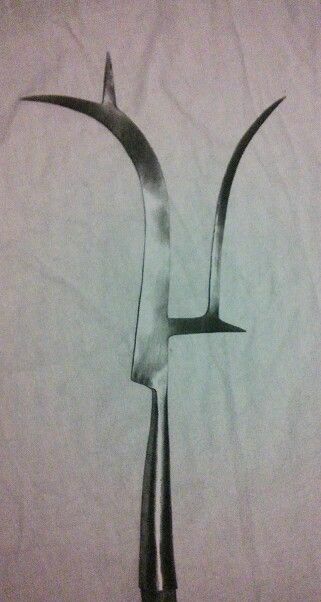 The reason I mention all of this is that, the items above posted by Mark, I would have identified as a fauchard-fork. Being that it is more sickle or scythe like in appearance with a long slender curved blade (not broad or stout like a woodsmans tool). And bearing fork-like projections facing away from the wielder expressly for the purpose of stabbing or binding. The primary difference between a fauchard and a sickle being the orientation of the blade to the haft (a sickle being mounted perpendicular). And that a fauchard was primarily a military weapon, and the sickle; an agrarian tool. I've noted that over-time Wikipedia has even swapped it's photographs. What today (2/4/2017) is shown as an example of the fauchard is the same photo that they had as an example of a Guisarme a few years back. And the guisarme entry now shows the illustration of Gawain and his axe. Polearm typology is pretty maddening because of the weapons bearing multiple names. And names seemingly attributed to multiple weapons bearing drastically different silhouettes over the centuries. It's gotten to the point when people come over my place and ask me what a particular polearm is I just say "That's a polearm". Sorry if this post only convolutes the answer to your questions. When I usually read military books about english warfare, they often associate the "forest bill" with the said "English Bill", not the welsh one. In any case, there is actually evidence of welshmen in english employ using such polearm? Because most of references of welsh warriors I found are usually from archers, infantry and cavalry javelin-throwers and the called "spearman" (which I don't know if they're talking about literally spearman or perhaps javelin-throwers). In any case, we don't have evidence for such weapons before 1450's? Terry, I also have read much of an misunderstanding on Guisarme/"Italian Bill" question. Could they be the same weapon? Joseph Swetnam mentioned the Welsh hook in this early seventeenth-century manual. Unlike George Silver, Swetnam made no distinction between the Welsh hook and other polearms. Swetnam preferred his staff (basically a spear) because he claimed the weight of the head makes hooks, bills, partisans, glaives, halberds, etc. less nimble than the staff. The Welsh hook likewise appears briefly in a variety of circa-1600 English texts. There are many different types of hedging bills in Britain, different regions producing different styles. When manual hedge laying was usual (i.e. quite recently in the scheme of things https://www.youtube.com/watch?v=WoprVhpOKIk&feature=youtu.be) there were many more than are easily available now. I think that "Welsh hook" is likely to simply have been a name for one of these styles mounted on a longer pole, or potentially for a style of what is called a "slasher" in this film. Whilst it would primarily have been carried by people from the area the style originated, I doubt very much it was a case of 'Welsh soldiers use a Welsh Hook and English soldiers use an English Bill'; the mix and match would have been greater (hence George Silver, an English Gentleman, being familiar and comfortable with the advantages of the Welsh Hook).